The others listed here only have the 150 Psalms and the Odes, except for № 22, which is incomplete at the end, and so it is not known what it had in addition to the 150 Psalms. Ps 151 not in the Graz manuscript, which ends with the Odes, but it is in Red. A, ed. M. Shanidze (at TITUS here). ხ(ოლო) მე სახელითა უფლისა ღ(მრ)თისა ჩემისაჲთა მოვიღე მახჳლი იგი მისი და მოვჰკუეთე თავი მისი და აღვჴოცე ყოჳედრებაჲ ძეთაგან ი(სრა)ჱლისათა. ἐγὼ δὲ σπασάμενος τὴν παρ᾽ αὐτοῦ μάχαιραν ἀπεκεφάλισα αὐτὸν καὶ ἦρα ὄνειδος ἐξ υἱῶν Ισραηλ. Today is the commemoration of Saint George across many Christian traditions, so it occurred to me that it would be suitable to offer a brief look at the text of his martyrdom in Sin. geo. 62, specifically the beginning, the end, and the scribes mini-colophon. These two short passages will not only grant us an opportunity to study some grammar and vocabulary, as usual, but also, since images of the manuscript are easily accessible at E-corpus (along with other manuscripts, Georgian and otherwise, from Saint Catharine’s, but not the new finds), an opportunity to study Georgian scripts and handwriting, mostly nusxuri, but also some asomtavruli. For a detailed treatment of this tenth century manuscript, where the Saint George martyrdom is found on ff. 29rb-38vb, see Gérard Garitte’s Catalogue des manuscrits géorgiens littéraires du Mont Sinaï, CSCO 165, Subs. 9 (Louvain, 1956), pp. 197-209. Images of the manuscript are available here, images 30-40; I include one image of the last few lines below, but I encourage you to have a look at the other parts, too. p. 41 (introductory parag. is not in Georgian) : ἐγένετο τοίνυν κατ᾽ ἐκεῖνον τὸν καιρὸν τῆς σατανικῆς εἰδωλολατρείας ἐπικρατούσης κατὰ τῶν ἀνθρώπων βασιλεῦσαι Διοκλητιανὸν τῆς Ῥωμαίων ἀρχῆς λοιμόν τινα καὶ θῆρα ἄγριον γενόμενον κατὰ τῆς τοῦ Χριστοῦ ποίμνης ἡττώμενον σφόδρα τῇ πλάνῃ τῶν ματαίων εἰδώλων. p. 51: ἐγὼ δὲ Πασικράτης ὁ δοῦλος τοῦ ἁγίου Γεωργίου ἀκολουθήσας τῷ ἐμῷ δεσπότῃ ἐπὶ πᾶσιν τὰ ὑπομνήματα βεβαίως συνέταξα· καὶ μακάριος ὁ πιστεύσας Χριστῷ τῷ ἀληθινῷ θεῷ ἡμῶν καὶ σωτῆρι, ᾧ ἡ δόξα καὶ τὸ κράτος εἰς τοὺς αἰῶνας τῶν αἰώνων. Ἀμήν. Now when the whole word was gripped with diabolical (lit. of the devil) idolatry, there was a king over the Romans whose name was Diocletian, a raging beast corrupting the flocks of Christ. And I Basiankartos [Gr. Pasikrátēs], the servant of Saint George, followed my master and I wrote down this his martyrdom truthfully and without changing anything, and blessed is he who will believe in Christ, the true God, and our savior, to whom the glory belongs, together with the Father and the Holy Spirit, forever and ever. Amen. Remember me in God’s presence, Saint George, and intercede for us! Amen. To file in “unexpected finds”: With no apparent relationship to the rest of the text on the page, the Georgian mxedruli alphabet (along with Armenian) is found in the large outer margin of a Syriac manuscript from Jerusalem containing the Lexicon attributed to Eudochus, &c. (SMMJ 295, perh. 19th cent.). 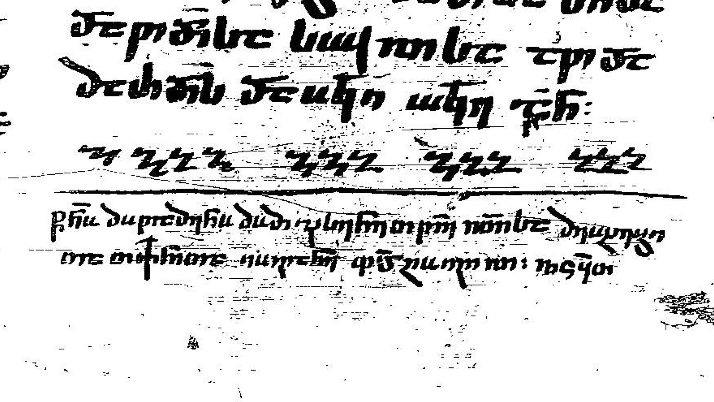 Here “Georgian” in Syriac is gergānāytā. 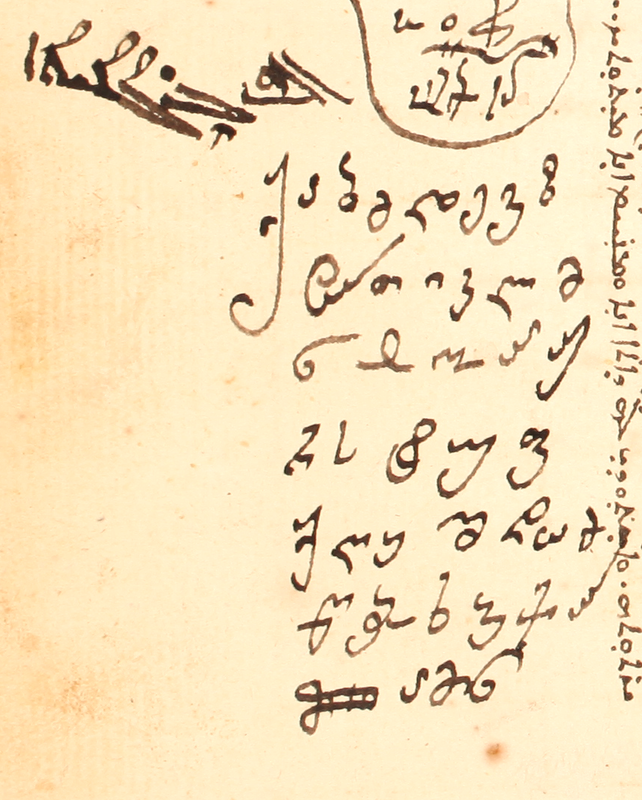 The writing begins with ქ, presumably for ქრისტე “Christ!”, and ends with ამ(ე)ნ “Amen”. The handwriting is not bad at all. There is no ჳ between the ტ and უ, but the other four letters obsolete in later Georgian (ჱ, ჲ, ჴ, ჵ) are here. For students of the languages, literature, and history of Christianity, the horde of manuscripts written or preserved at Saint Catherine’s Monastery on Mount Sinai is among the most valuable collections. Manuscripts there were microfilmed several decades ago, and we can be very grateful that scans of those microfilms have been made accessible through E-corpus. While the images are bitonal, and thus not everything is as readable as we might like, in general the writing is clear (at least in black ink, others less so). Below is an image from Sin. Geo. 62 (Garitte, Catalogue, pp. 197-209), a hagiographic manuscript of the late tenth century written by Iovane Zosime, from whose pen several manuscripts survive. Here is a note at the end of a text in which he requests prayer. Sancti martyres mementote mei coram Deo intercessione vestra, Iohannis valde peccatoris; orate. Holy martyrs, remember me before God, John, the great sinner, through your intercession! Pray!